On August 11th, 2017 the Oklahoma Sheriffs’ Association hosted our Annual Awards Banquet at the Reed Conference Center in Midwest City. The event honored over 100 individuals from the Sheriffs’ Offices statewide. Awards such as the OSA Scholarship Awards, Meritorious Service Awards, Medals of Valor, Life Saving Awards, and Legislative Awards are all given at the Awards Banquet. Additionally, the traditional Of-the-Year awards are also given that evening. This year, Sheriff Joe Lester of Cleveland County was the recipient of the 2017 Sheriff of the Year award. The OSA also inducted Sheriff Norman Fisher of Cherokee County into the Sheriffs’ Hall of Fame. 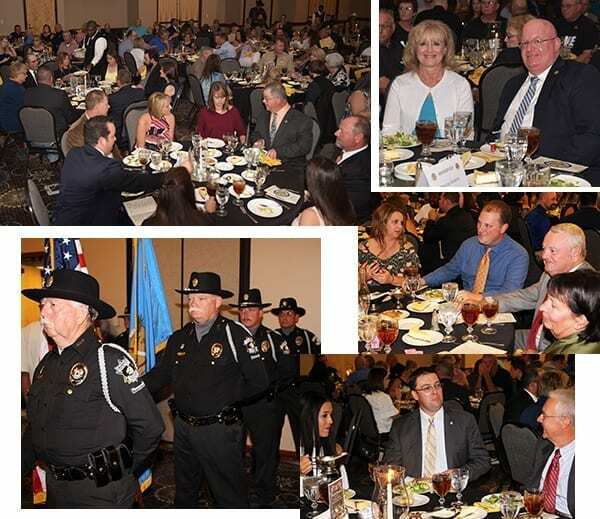 The Banquet had nearly 450 individuals in attendance, consisting of many Sheriffs and their families from across the state, as well as 22 Oklahoma State Legislators. Of those 22 Legislators, Representative Jon Echols also graciously acted as our Master of Ceremonies. The Oklahoma Sheriffs’ Association would like to thank all who attended and showed their support for the OSA. It is our pleasure to honor those individuals yearly who go above and beyond the call of duty for the Sheriff’s Office. This entry was posted on Monday, August 28th, 2017 at 9:57 am and is filed under Uncategorized . You can follow any responses to this entry through the RSS 2.0 feed. Both comments and pings are currently closed.